It's that time again...Labor Day!! To me...that sounds like it's time to fire up the barbecue and cook up some delicious burgers. Instead of making the same old burgers, I thought I'd try a little something different and for the Vegas Morning Blend. I was inspired to do something a bit more unique than what we typically see today, and I'min this whole Asian cooking phase right now...so I thought...why not re-create some of my favorite Vietnamese flavors/foods into a burger? 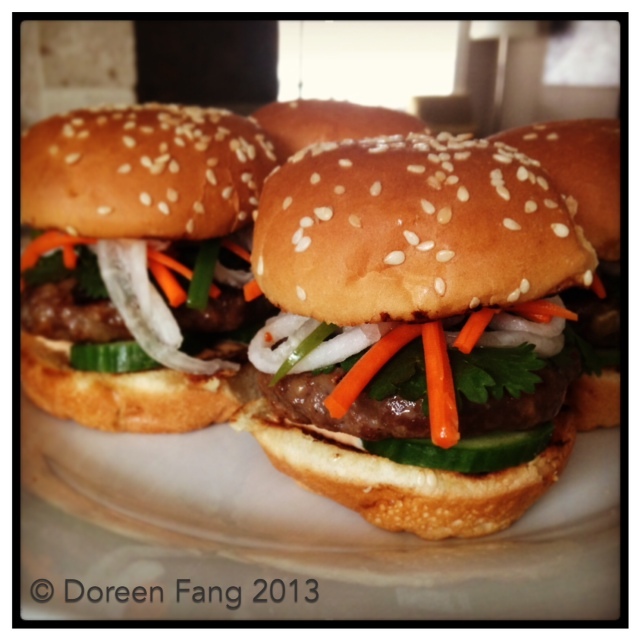 That's how I came up with the little banh mi sliders. Yes, technically a banh mi sandwich really refers to the light crispy, airy baguettes used for these wonderful sandwiches. In this case I am taking all the great flavors and textures in the sandwich and created a burger/slider with it. These cute little sliders are bursting with flavor and please feel free to kick up the heat with more jalapeños or sriracha in the recipes. I know making this requires quite a few elements...but it is definitely worth making each component. If you want to purchase the pickled veggies to save time...go for it. Please enjoy and I wish you and your family a happy and safe Labor Day Weekend! Stay tuned to watch this segment on KTNV-ABC 13 on Sunday at 9am in Las Vegas. The video will be posted on their website Vegas Morning Blend on Monday morning. Combine all the ingredients in a bowl. Add 1/3 cup of Doreen’s Asian marinade (see recipe below); use your hand to thoroughly combine the meats and marinade for 1 hr. Reserve the remaining marinade to baste burgers while grilling or to marinate other meats. Weigh out 2 ounces of meat, form into a ball and flatten into a circle, approximately 3” in diameter and 1/2” thick. Or make patties to desired size. Heat grill to med/high heat. Put the patties on the grill and cook for approximately 3 minutes on each side or until done. In a medium bowl, combine the sugar, mirin, seasoning sauce, fish sauce, green onions, garlic, ginger, pear nectar and black pepper. Stir till sugar is dissolved and all ingredients are combined. In a small bowl, combine all the ingredients and mix until completely blended and smooth. Taste and add additional salt if needed. In a non-reactive bowl, add the daikon, carrots and jalapeños, sprinkle with 1 teaspoon of kosher salt and 2 teaspoons of sugar. Gently knead the salt and sugar in the vegetables; allow mixture to sit for a few minutes, this will draw the water out of the vegetables. Gently squeeze the water out of vegetables. If you are able to bend the daikon or carrot from end to end without it breaking, the vegetables are ready to be pickled. Rinse the mixture off in a colander; drain, return to reactive bowl or container with lid. In a small non-reactive bowl, combine the 1/2 cup lukewarm water, 1/4 cup sugar, ¼ teaspoon salt, crushed red pepper and 1/2 cup+2 tablespoons vinegar. Stir until the sugar and salt have completely dissolved. Pour into bowl with vegetables, making sure all the vegetables are covered. Cover and refrigerate for at least one hour. This can be made a 1-2 days ahead of time. Put the Sriracha mayo on the inside of both the bottom and top bun. On the bottom bun, add a few slices of cucumbers, top with the burger. Add a few sprigs of cilantro on top of the burger, top off with a generous amount of pickled veggies. Put your top bun on and it’s ready to be served. Optional: butter and toast buns on grill before serving. Chef’s Note: There are quite a few components to this dish; in order to save time, you can purchase your pickled vegetables.